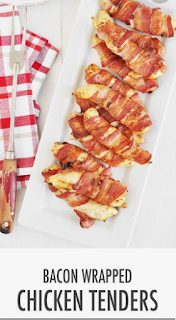 Try these delicious Bacon Wrapped Chicken Tenders for a great no-carb meal. They're easy to make and great throughout the week. Preheat oven to 450 degrees F. Line a baking sheet with foil and set a wire cooling rack on top. Set aside. In a large bowl, toss together the chicken tenders with the seasonings until well combined. 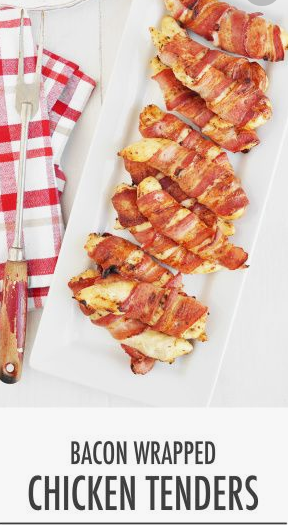 Wrap a piece of bacon tightly around each chicken tender, skewering a toothpick on both ends to secure. Place the chicken on the prepared pan and continue wrapping the rest. Bake the chicken until cooked through and browned, about 15 to 20 minutes. Remove from the oven, and set the broiler to high. Carefully remove the toothpicks from the chicken and place under the broiler until crispy on top, about 5 minutes. Serve immediately or let cool and store in an airtight container in the fridge for up to a week. 0 Response to "Bacon Wrapped Chicken Tenders"